So! He’s still there. Or maybe he’s a she. Whatever, it’s still there. In the Mill Pond. For those of you who are familiar with last weeks blog you may remember the loon that landed in the Mill Pond in search of a mate, believing that a decoy was the real thing. Well, by now wouldn’t you imagine that the loon would have left—aware of its mistake? Not the case! The decoy has vanished, retrieved by its owner, but the loon continues to navigate the small body of water across from the post office, feeding off an occasional baby trout swimming downstream. Yesterday, I noticed a Great Blue Heron, neck reaching into the sky, legs planted gracefully on the bank of the pond, staring in the direction of the loon. Even the heron wondered why the loon refused to move on. After several minutes the heron waded into the water and flapped its six foot wing span. Although I do not understand all elements of aviary communication I speculate that the heron was signaling to the loon: “Open your wings. Fly out of there!” The loon failed to respond and soon the heron flew off, over Daby’s hotdog stand, to an inlet along the Schroon River where the bird had a nest. Thus, my quandary. Why does the loon remain? To be deceived by a decoy, that’s understandable, but, after several weeks, the loon should have learned. Enough is enough! As I researched the subject, loon lore provided insight. According to legend, when the first loon was made, God, (If you are a creationist), or nature, (if you are a naturalist), forgot to attach legs to this creature. Realizing the mistake the creator hurled legs after the loon as it departed on its maiden flight. The legs barely caught up with the loon, attaching themselves to the extreme backside of the bird. 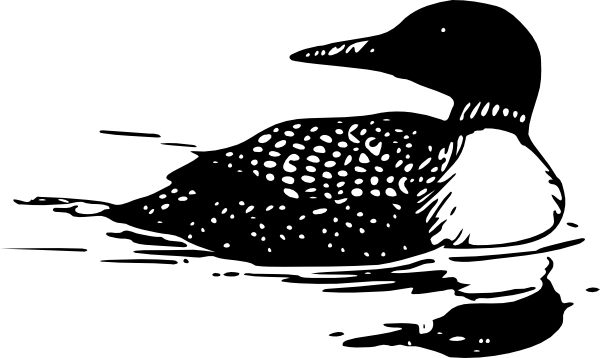 Whether or not this story is correct, anatomical science confirms that the position of the legs hampers the loon’s ability to take off from water or land. In fact, the normal flight pattern of a loon necessitates a runway of more than 500 feet, exceeding the length of the Mill Pond. (Incidentally, the diminutive size of the pond is also one of several reasons why there are not any whales in the Mill Pond!) In other words, the poor loon, unable to take off, is stranded and will linger in the Mill Pond until rescued. The moral of this story: In life, be careful not to find yourself in a situation you can’t get out of. July 23, 2016 in Brant Lake.